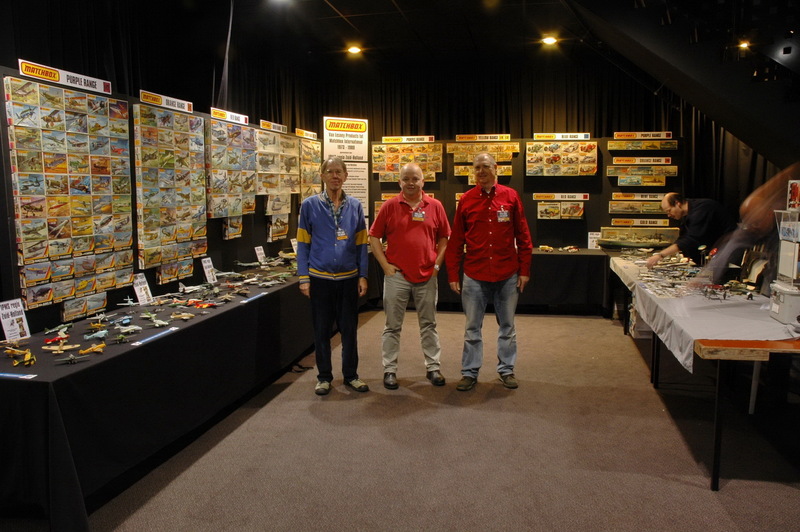 At the Euro Scale Modeling 2016, the South Holland region presented the complete history of the Matchbox brand, with all boxes and many models. 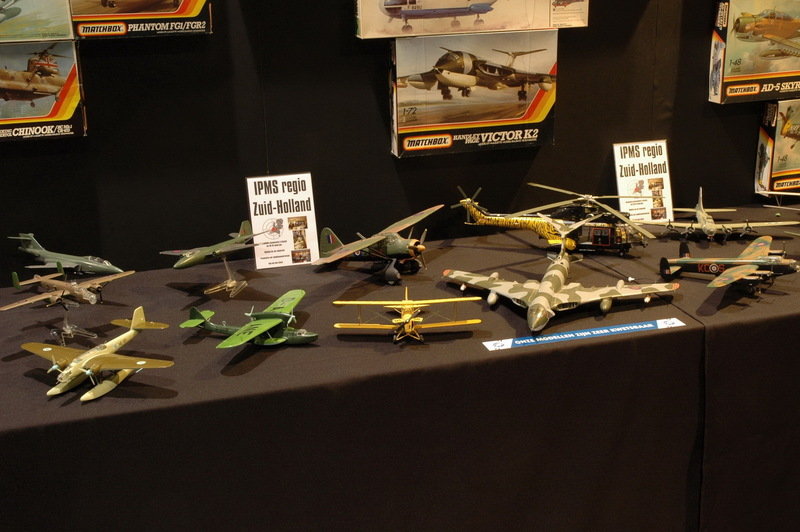 In this report, we look back on this unique show. Because it was such a big project for the club, we also look at the history of its development. During the regional evening of the South Holland region in June 2014, Reinhold Bogaard gave a presentation entitled 'Matchbox - rise and fall'. 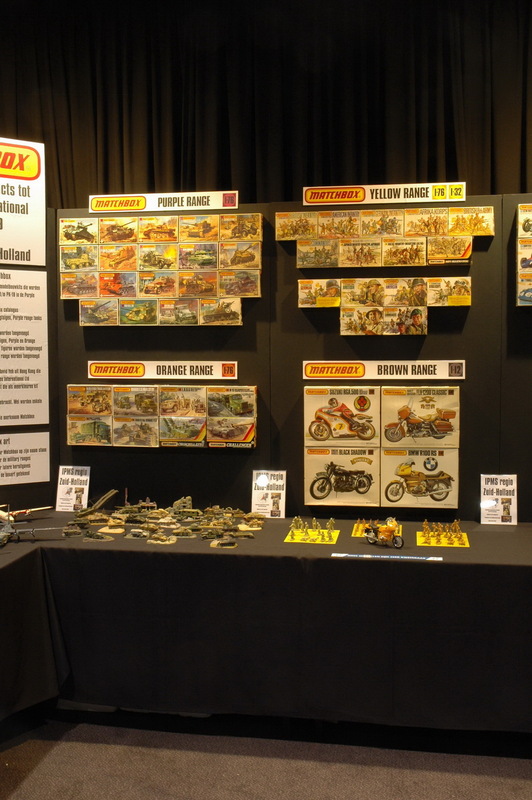 Reinhold is a collector of Matchbox kits and has all the brand releases. 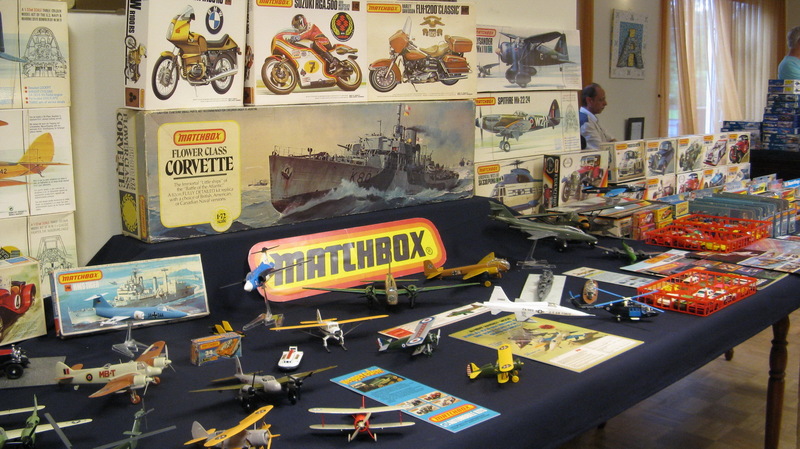 He has also built a large website on the subject, www.matchboxkits.org. 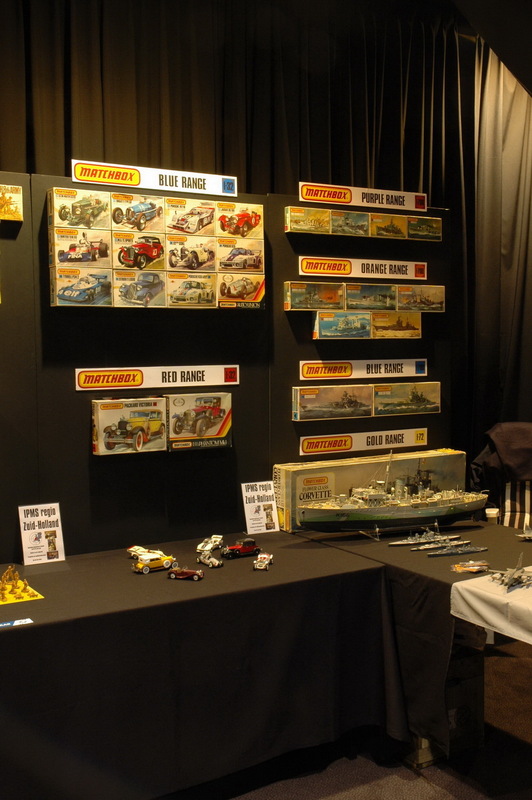 To support the presentation, Reinhold and Leo Ripken had built up a large table full of Matchbox boxes and models. 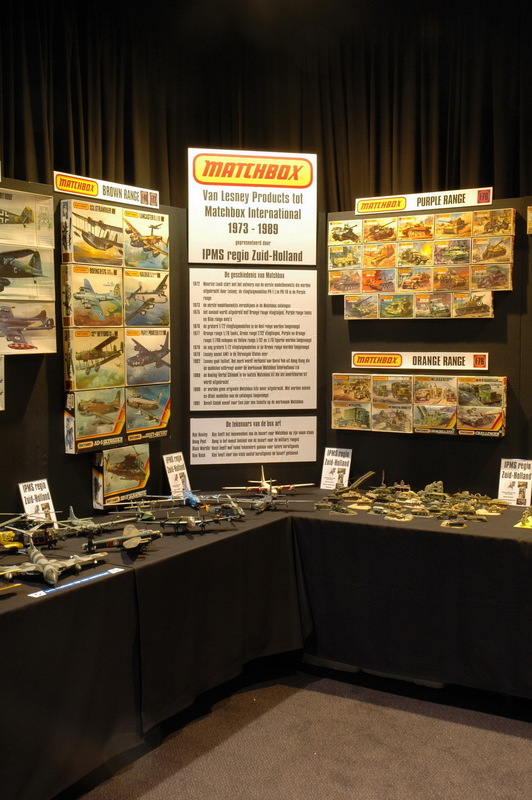 The Matchbox display looked so great that the idea arose to organize a regional table on the ESM around this theme in the future. 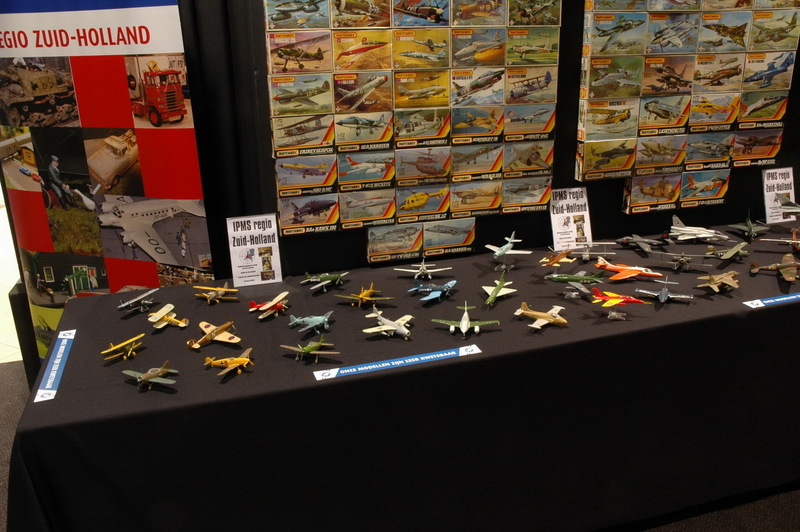 It was a unique opportunity: we had a complete box collection, we had quite a few models in the typical Matchbox colors, it is a brand with a great modelling history, and it is a brand that evokes nostalgia and sweet memories to most modelers of some age. 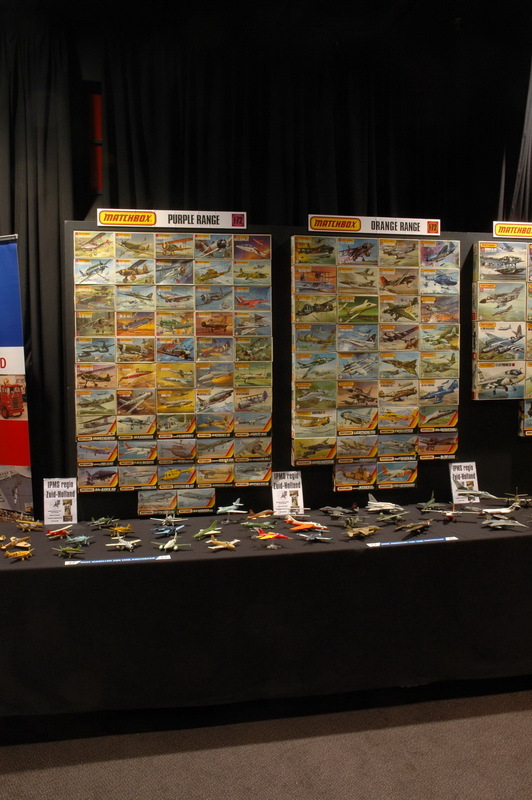 We could organize a display not previously shown on an ESM: the history of a brand in boxes, models and catalogs. After the presentation, Rob de Bie, Reinhold Bogaard and Leo Ripken started working on the idea. 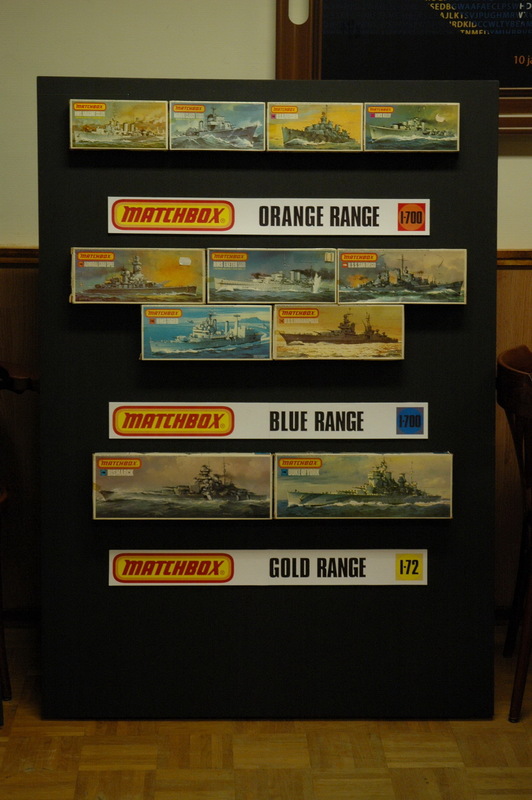 Considering the almost complete collection of Reinhold, the plan was soon to show the entire history of Matchbox. 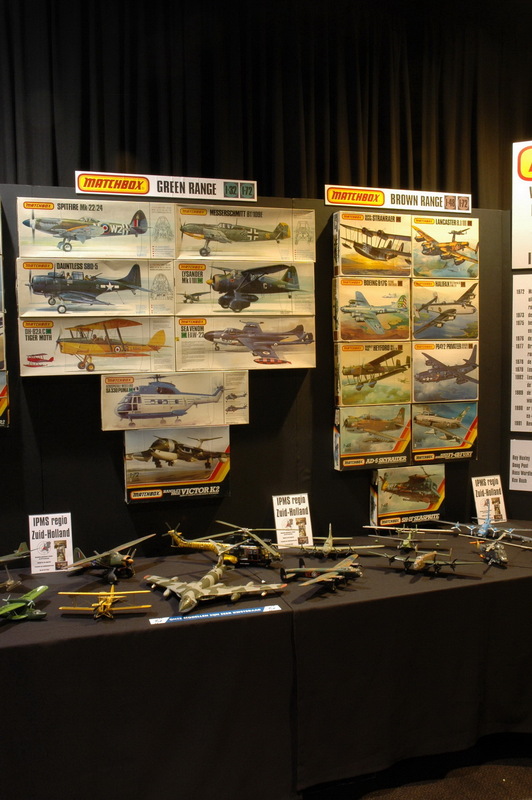 Matchbox had released about 200 models, and that number of boxes was just manageable. 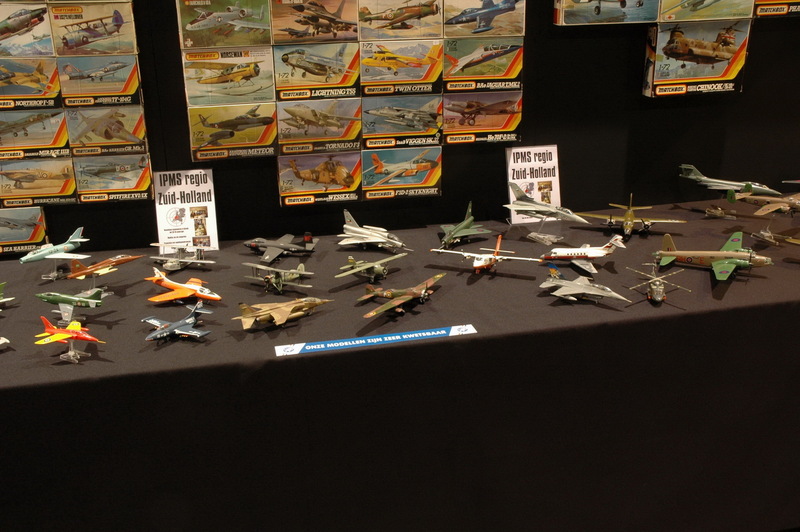 The dozens of kit boxes would be supported by many built models, both unpainted in typical multi-colored plastic and painted. Rob de Bie started drawing to see how a stand could be made of this. In particular, the box exhibition had been studied in many concepts and variants, around twenty, and some prototypes have been built. It was not easy to find a concept that had the lowest possible costs, could be built up quickly, could not fall over and could also be transported. 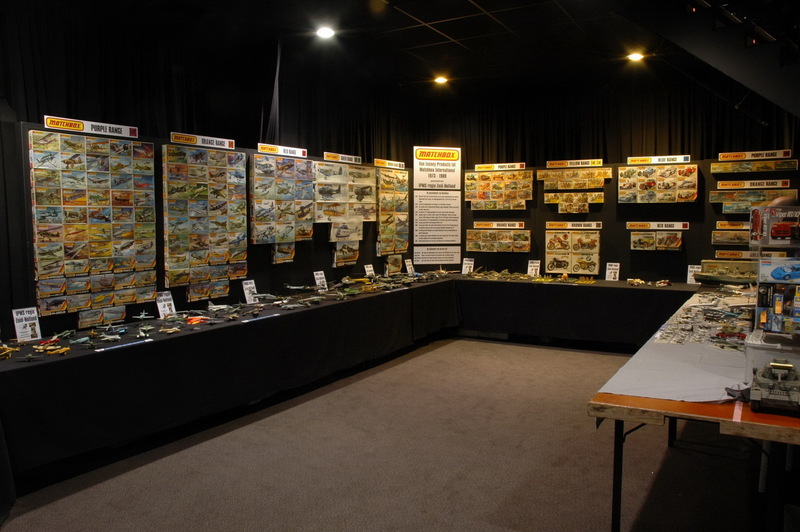 Unfortunately, things had to be deleted too, like a panel with all the catalogs, because otherwise, it would become too big and expensive. The ESM organization was short of space. The result of the concept study was a stand consisting of ten black foam board panels, each measuring 1 meter wide and 1.40 meters high, with a complete 'range' or multiple 'ranges' on each panel. A test panel was built and it showed that it looked good: the box art contrasted nicely with the black background. 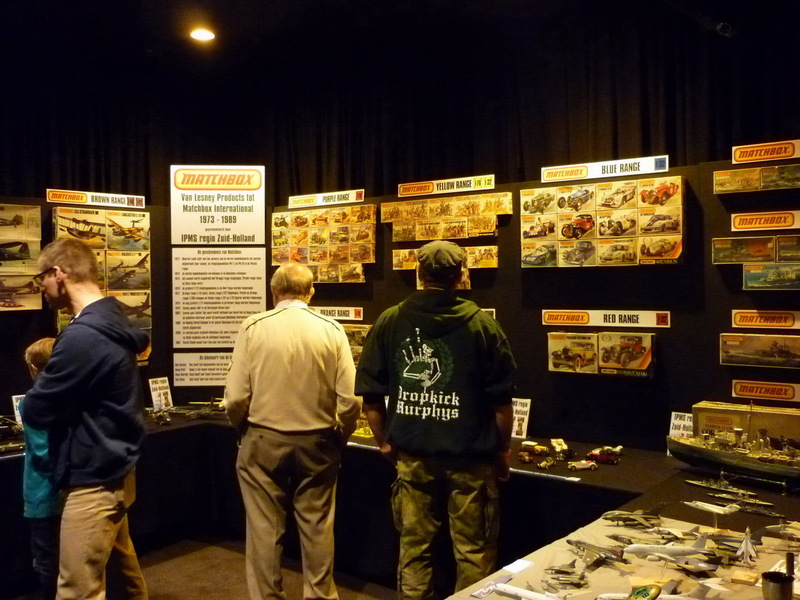 We saw that the stand would need much more work than a 'normal' regional table, and would become a considerable logistical operation. 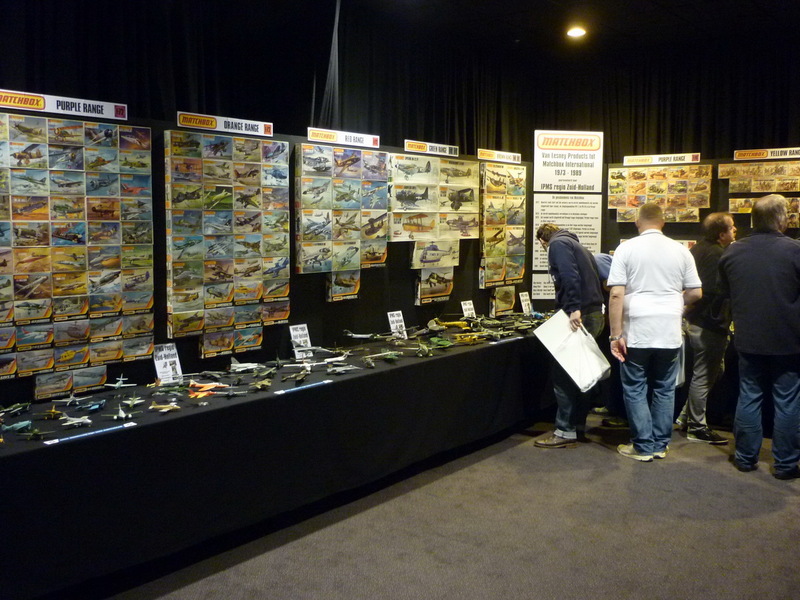 We, therefore, decided not to schedule this stand for the 2015 ESM, but a year later so that we had more time for the preparations. That has proved to be a wise choice. During the ESM of 2015, the possibilities in the halls of the NBC were examined. It turned out to be no easy task to find a good spot for a 10-meter long stand against the walls of the two rooms. There appeared to be only one possibility: the stand had to be placed in a corner and left after the entrance of the Grand Hall. With a little effort, the organization was convinced to reserve this place for our stand. The traders who usually stand there were given a different place once. The last hurdle was the finances. A budget was drawn up, and the expected material costs were no less than € 493. 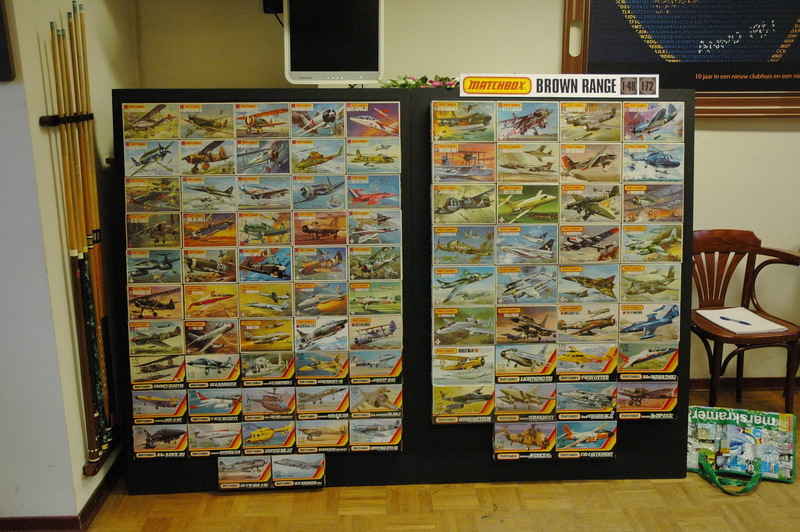 Half of these were found in the clubhouse, the rest were laid out by the club members. There were two large donations from two members who had something to celebrate. When the plan was complete, Rob de Bie started to build the panels. Foam corner profiles had to be glued to each foam board panel at exact distances so that the boxes could be clamped between them. To this end, a dozen MDF planks have been sawn at the local timber store to serve as distance molds. Foam beams were glued to the back of each panel for strength and to connect the panels together. Including drying time of the glue, each panel was about 6 hours of work. 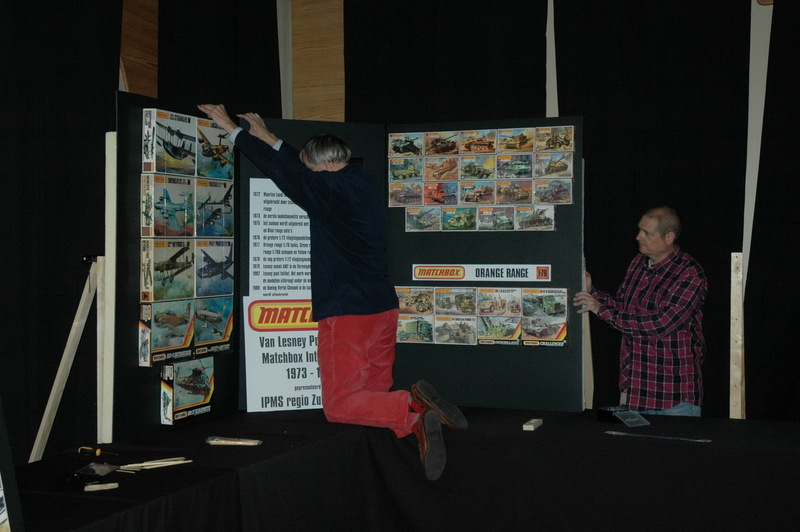 Every region evening of 2016, another panel was delivered, which was immediately tested with the boxes taken by Reinhold Bogaard. 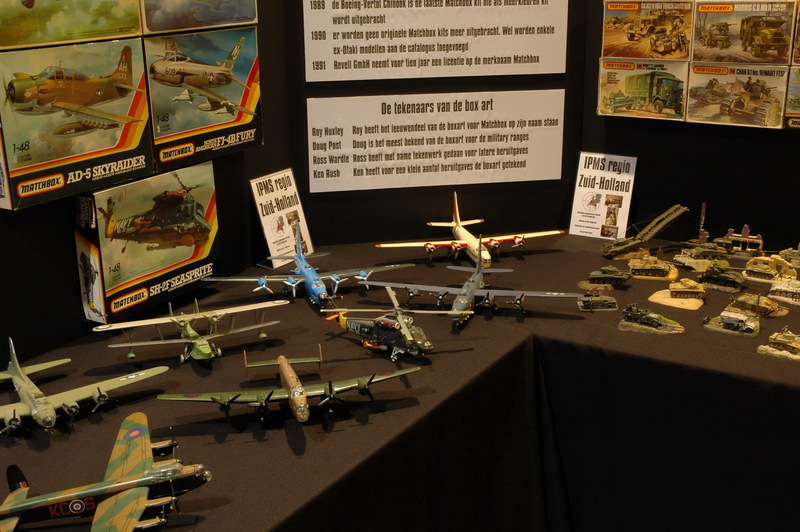 Reinhold had selected the best boxes from his collection for this. The regional members could also see the progress, and designate the boxes they had built themselves. The panels were hardly transportable: a plate of 1, 00 x 1.40 meters could be fitted with the greatest difficulty in a middle-class sedan car. The production of the many signs started, which were mostly made by Patrick Verschut. They were all in the font that Matchbox used on his boxes. 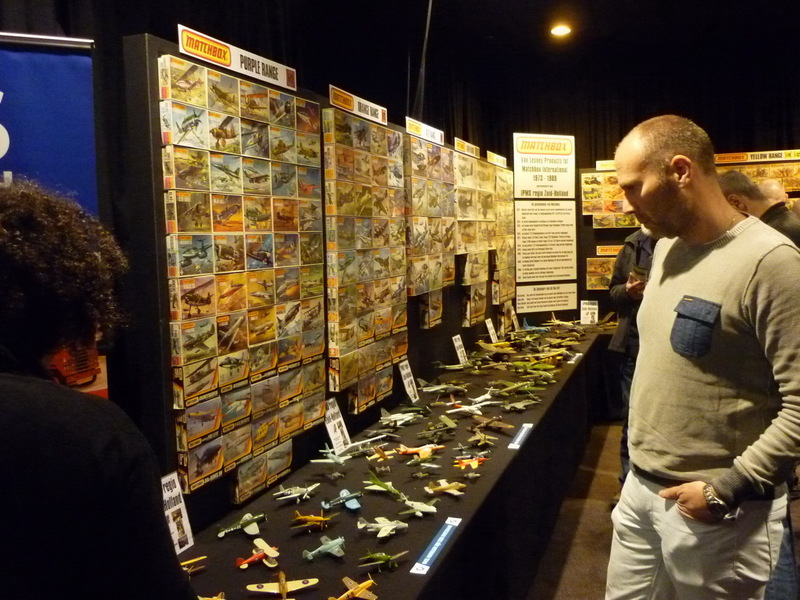 Meanwhile, Leo Ripken was busy building as many unpainted Matchbox models as possible. That's no easy task, since no filler may be used, and glue stains are also taboo. 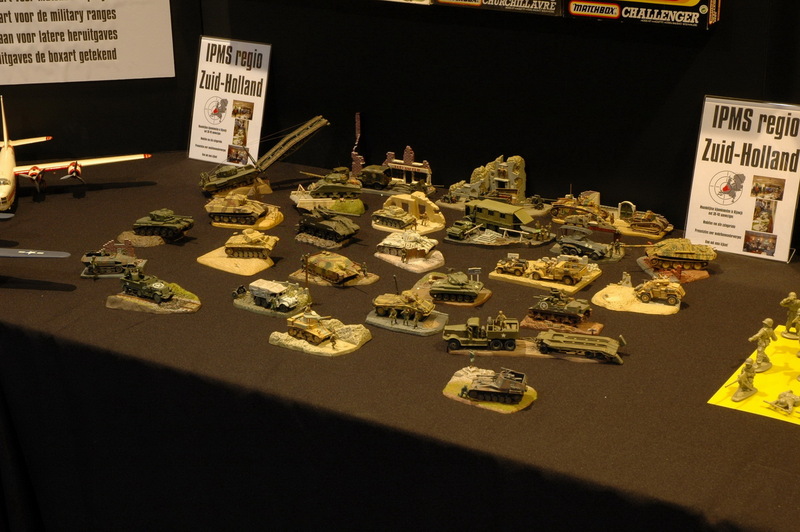 On the regional evening of July 2017, Leo gave a preview of the model show by putting the Purple Range models on a black surface so that the colorful colors came out nicely. 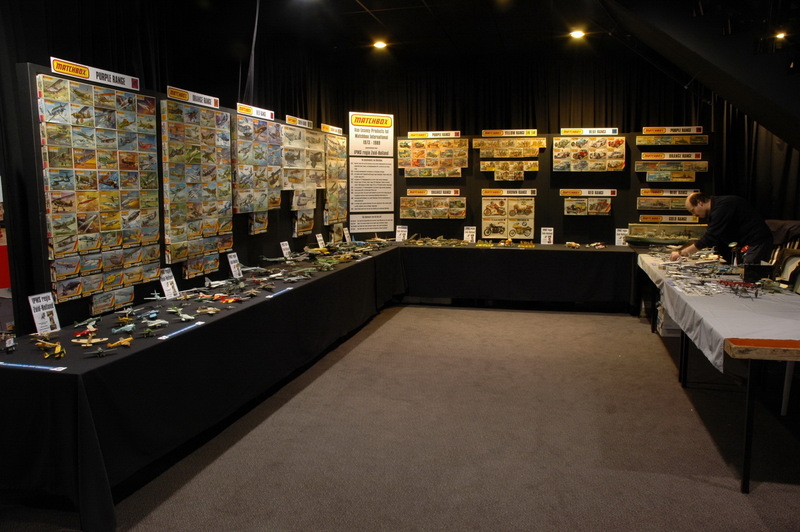 Leo also made an inventory of all members who had built Matchbox, so we could show as many models as possible. On the Friday before the ESM we built up all the panels in Voorburg. For this, Reinhold Bogaard had to drive twice to get the many crates of boxes. With a team of six people, the panels were filled with boxes. As extra security also thin fishing wire was stretched over the boxes, and that was a lot of work. We wanted to prevent boxes from falling out of the panels, on the built models. All boxes were full with the kit parts since logistics would be a nightmare to empty and store the contents of 200 boxes separately. 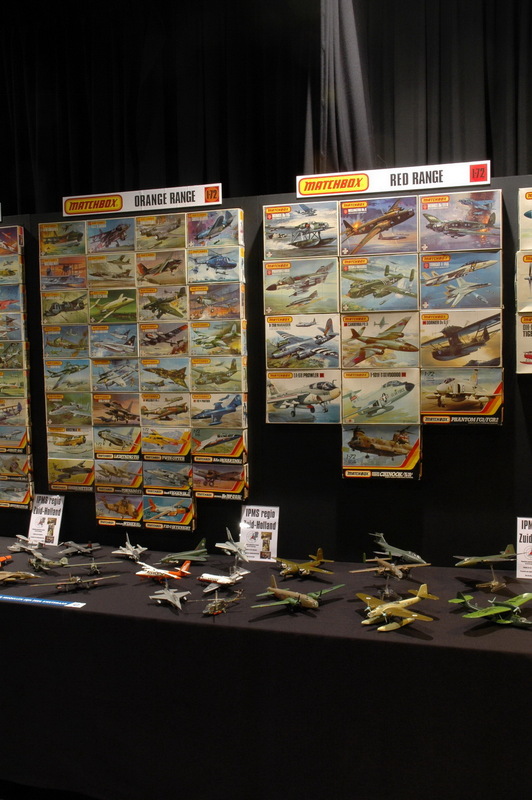 Another reason was the fear of 'shopping' visitors, who might want to take a box out of the display for better viewing or buying. That fear turned out to be unjustified in retrospect. When the panels were built we were able to drive to Nieuwegein around dinner time with two specially organized cars that were big enough for the panels. Then the build-up team could start to screw the panels on the tables against the wooden supports and connect them together for a seamless wall. Fortunately, that went completely according to plan, because we no longer had time for changes. 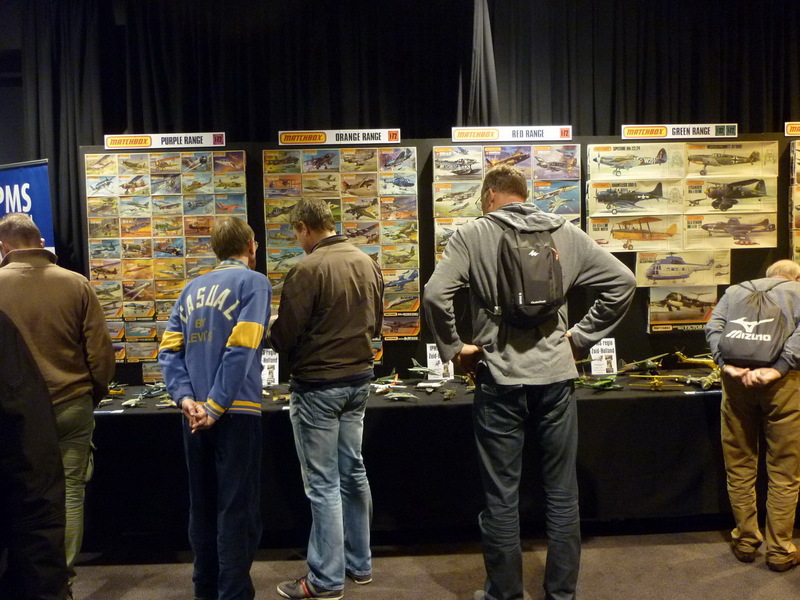 Thanks to the following club members for help with the construction and transport: Patrick Verschut, Jan de Wit, Benno Groot Wassink, Wim Klerk, Kees Onderwater and Annamarie Jongbloed.